Riding a bike is one of my favourite things. I live in Toronto. I count myself fortunate to be able to ride to work but I also ride everywhere, for anything. I ride in winter, to the shock of friends and family. I ride on vacation and visit bike-minded things, such as the transport museum in Glasgow! I just love biking and bikes. Always have. 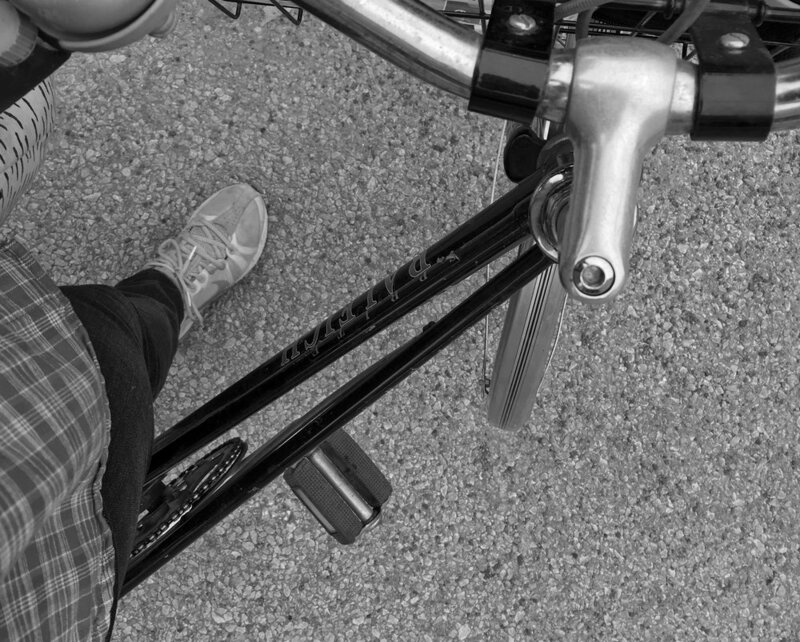 There's just something about the bicycle and the freedom and convenience it brings. June is bike month and so far, in Toronto, a lot of cyclists have died. This fact is too crucial to ignore. I remember when I started cycling in the city. I think it was the mid-late 2000s. I bought a used blue Browning, with a 3 gear internal hub, and rode it to work--12km from downtown Toronto to the west end. But that wasn't the first time I rode in the city. One summer, taking classes at university, I got tired of commuting in from Oshawa via car and decided to take my bike on the GO. I was so nervous. I had ridden on the back roads of Durham, crossing busy highways and more, but the city was something else. I felt like I stuck out--this huge mountain bike and me, trapped at an intersection (on foot) not wanting to block anyone. I stayed there for 5 mins until I finally had the confidence to ride north on this downtown street. I remember feeling invincible when I started riding to work for the first time. I suppose being young does that. Cycling advocates will often urge you to "take the lane", "share the road" so I did just that and felt like no one could stop me. Plus there's all these rules and by-laws, right? I've tried to describe it like there was a protective bubble of confidence around me because, well, most importantly, I'm a human being on a bicycle and am no match for a gigantic metal car. Surely anyone passing would do so with caution because my life is at risk. I've learned that that simply is not true. I've stopped recommending cycling as an option to my friends and family. I've been hit a couple times. One time, post-collision, while the guy who caused it went to work on the elevator that was more pressing than the current situation, the attending police officer decided it was a great time to complain to me about bike lanes in the city. The same officer helped me later when the guy who hit me refused to cooperate (we agreed I wouldn't press charges if he would reimburse me for my bike, etc..). But this is what you can expect as a cyclist in the city. I've been harassed on my bike. One time, police suggested I choose another route. I used to report people parking in bike lanes. You get tired of being on hold for 15 mins+, then being told that there's only 2 people that monitor the east end, and the budget is so low, etc.. I used to report bad drivers via Toronto Police's complaint site. I've stopped doing that too. Long story short, the avenues for recourse are...not great. The biggest consequences are not reserved for the offending road user and the system is built in a way that favours them and the chaos they cause. "Share with Care" sign in Wales. The life of a pedestrian, a cyclist, even another driver, is nothing to that individual driver that drives carelessly, recklessly. That life has no value, no meaning, no weight on their actions. On the flip side, there's also human error that weighs into the delicate dance on the road. Misunderstandings, forgetting to signal, confusing or lacking infrastructure. It all comes into play. Which is why many advocates are now calling for Vision Zero---aka zero deaths. It's achievable but change is so, so slow. It also requires a complete change of thinking in a very car-centric country, with car-centric rules, car-centric infrastructure. You inadvertently become an activist of sorts if you ride a bike in Toronto---anyone who does knows why. Your life is on the line at all times so eventually you've just got to do something about it. I certainly consider myself a cycling advocate and activist. Recently, I've shied away from advocacy for various reasons. Lately I've hit a lot of dead ends. That's not a good enough reason to stop though. It's like never flying because a plane might crash. So you can ask for (or demand) better: from infrastructure, city officials, drivers, other cyclists---people. I feel the need now, with all of these cyclist deaths, and the city doing basically nothing, to share some of the great resources in this city for cycling. The greatest act is continuing to ride, so ride on! (no really!). Join Cycle Toronto and help advocacy for cycling in Toronto. They have great events and calls for advocacy. There are also special ward groups--Ward 32 Spokes meets at Feathers pub in the east end every third Thurs of the month. Ask your local councillor / MPP / MP / Mayor / Prime Minister / etc.. if they support cycling and cycling infrastructure. Subscribe to blogs and website newsletters, such as BikeTO.ca. If you're on social media, there's some FANTASTIC people to follow. Find them via #bikeTO or #CycleON or #VisionZero. Bells on Bloor (started originally as advocacy for bike lanes on Bloor--which are here, and beautiful, and permanent). Supports other group rides and is a great resource for all things bike advocacy + more. Bells on Danforth - Support bike lanes on Danforth! This year's ride is on Sat, June 16. Bike to Work Day - Usually the last Monday in May, to jump start Bike Month (June). I love the descent down Yonge, surrounded by cyclists. Ride for Safe Streets - Organized by Cycle Toronto, Support safe streets. This year's is Sept 22. Another group ride is one arranged by ARC (est 1996) for the Ghost Bikes. These are mournful but important, often starting at Spadina/Bloor and ending where a cyclist has been killed. At that point, a bike, painted white, is installed and a moment of silence is observed. Fundamentally the change starts with us, and urging our municipalities, the province, the country, to do better. If you drive (or ride), do so carefully and slowly. It starts with me and it starts with you.